Whole grain quinoa seasoned with fresh herbs, including fresh mint, parsley, lemon juice, and green onions, makes this salad recipe healthy and low-fat, as well as vegetarian and vegan. Don't let that scare you―it tastes good too and is just bursting with plenty of fresh ​flavor! Whole grain quinoa cooks quicker than most other grains and is an excellent source of vegetarian protein with about 11 grams of protein per cup of cooked quinoa. 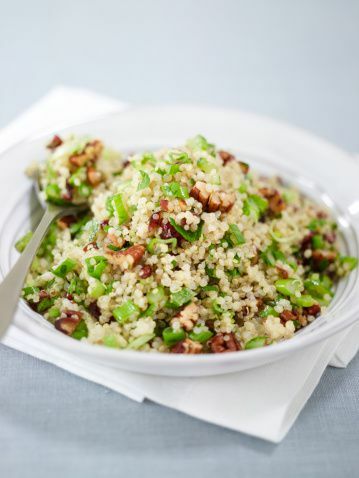 This quinoa, pecan, and fresh herb salad is both vegetarian and vegan, and it should be gluten-free as well, however, many garlic salts will have additives which may contain hidden gluten, so if you need this recipe to be gluten-free, carefully read the label of your garlic salt, or use a gluten-free alternative to season your salad. In a large bowl, combine the quinoa, nuts, parsley, and mint. In a separate bowl, whisk together the olive oil, lemon juice, and garlic salt, then pour over the pre-cooked quinoa. Gently toss this dressing together with the quinoa to disperse evenly and combine well. Season with a generous amount of salt and pepper. Place your quinoa salad in the refrigerator and allow to chill for at least 15 minutes before serving to let the flavors blend. Gently toss again before serving, and taste to see if more salt and pepper is needed; adjust seasonings to taste.